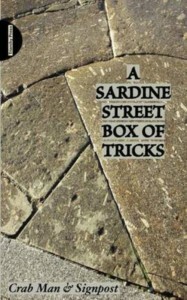 A Sardine Street Box of Tricks is a handbook for anyone who wants to make their own 'mis-guided' tour or walk. Written by 'Crab Man' and 'Signpost', the book is based on the mis-guided 'Tour of Sardine Street' that they created for Queen Street in Exeter during 2011. The book is designed to help anyone who makes, or would like to make, walk-performances or variations on the guided tour. It describes a range of different approaches and tactics, and illustrates them with examples from their tour of Queen Street.